The two biggest makers of streaming media players, Microsoft Corp. and RealNetworks Inc., have been working on major upgrades. Final versions of the free downloads should be available now. Media Player 7's Skins and Visualizations Gallery gives users several unusual looks to choose from. I tried both when they were in the near-final beta stage and found that Microsoft, though still far behind in market share, is fast becoming a serious player'pun intended'especially on the client side. 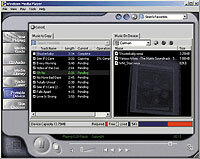 The user interface of its Windows Media Player 7 is radically redesigned from that of its Spartan predecessor, which looked liked a glorified Windows pop-up window. Media Player 7's interface is a simulation of some metallic-looking electronic gadget, though you can change this exterior to seven other skins, some of them pretty wacky. My favorite: a green, alien head with a video screen in its skull and ears that expand to become control panels. Microsoft Windows Media Player 7 allows easy transfer of music or other files to handheld devices, storage disks and other locations. Media Player 7 is free. A jukebox, radio tuner, and support for portable media devices are new and have been integrated into the main program. The screen-capture feature lets you share screens and annotate them with voiceovers, a potentially useful training tool. RealNetworks has a similar feature called RealSlideshow Basic, but it isn't built in. The play and stop buttons on Media Player 7 are much larger and easier to find than before, and even larger buttons provide one-click access to major components such as the audio player, radio tuner and media guide, the latter being an online list of topical video and audio files. Microsoft claims this is the best-integrated Web player, because all the players run from within the interface, rather than loading separately. I agree. Setup was easy, taking only five minutes with no surprises. New WOW bass technology from SRS Labs Inc. of Santa Ana, Calif., produced noticeably deeper bass and a richer sound, though it's a minor improvement in the scheme of things. The ability to burn CDs on a recordable or rewritable drive was expected to be in the final version, a first for Windows Media Player, but it wasn't in my beta copy. Ignoring for a moment the more important issue of RealNetworks' much higher market penetration and judging Media Player 7 in a vacuum, I agree with Microsoft that its player is better integrated and easier to use than even the spanking-new Real Entertainment Center. 'Manage your bandwidth. Video gets bigger, sharper and more natural looking when streamed at broadband speeds of around 200 Mbps to 500 Mbps or more. Over dial-up lines, it's the pits. 'Make sure a vendor's media technology runs under your agency's server and client operating systems. 'Perform server scalability tests to verify that a streaming media platform can handle the expected Web traffic. But RealNetworks' upgraded player, which now comes with jukebox and file-download players in the Real Entertainment Center suite, does have features that compensate for its slightly less intuitive and minimally integrated interface. For one, it brought the radio tuner into RealPlayer's interface and has a video player, RealVideo8, with purportedly better image quality and smoother playback than its predecessor. It also has iQfx 2.0 Basic from QSound Labs Inc. of Calgary, Alberta, an upgrade of Qsound's simulated 3-D stereo software that has improved bass. But RealNetworks' upgrade is not nearly as dramatic as Microsoft's. Real Entertainment Center offers much more incremental improvements. Like Media Player 7, RealPlayer installed quickly and easily. I liked its Take5 daily news and entertainment update, and found it quick and efficient at finding and downloading plug-ins that it needed to run unfamiliar file formats. It's important not to get hung up on differences between the two players. Streaming video technology in general could still stand improvement. I wasn't able to test the players on broadband networks, which are used on many government intranets. But some government employees will be tying in over 56-Kbps modem lines, as will much of the public. Over such slow connections, audio is impressively deep, but video is herky-jerky, off-color, tiny, dim, fuzzy and out-of-sync, as it has been for years. Sometimes the video just stops for several seconds while the player's Internet congestion light flashes. I noticed little difference in the video quality of the players, despite the manufacturers' claims. Make no mistake, streaming video over dial-up Internet is a useful and potentially important medium. It's better than nothing, but it should be used only to spice up sites that still attempt to effectively convey 95 percent of their information through words and still images.